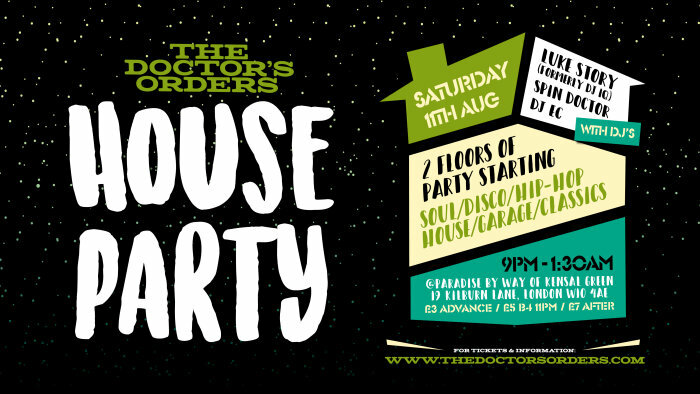 The Doctor's Orders are bringing that house party energy across both floors of West London's best-loved venue Paradise. With an open sound track of the best in new and old RnB, Disco, House, Hip-Hop, Garage and beyond in true house party style. With a different line up every month things are kicked off with three of London's most exciting DJs in the shape of Spin Doctor, Jimmy Plates and DJ EC for this new exciting party from London's premier party providers.